﻿﻿﻿﻿﻿﻿﻿Enchanted Rock offers more than a climb to the top. OK, I admit it. The only thing I did on my first trip to Enchanted Rock State Natural Area was hike to the top of the majestic pink granite dome for which the site is named. After all, its massive size and spectacular beauty beckoned me to the summit for the awe-inspiring views. As I stood on top, trying to catch my breath, I could see for miles. It was indeed gorgeous, and many others agree, making it one of the most frequently visited sites in the Texas state park system. “Of the more than 250,000 visitors per year, a good number of those visitors hike to the top of Enchanted Rock, take in the view, turn around, hike down, cross it off the bucket list and then leave,” park interpreter Scott Whitener says. However, there’s much more to Enchanted Rock State Natural Area than “just” the rock. Since that first visit, I’ve hiked nearly all of the trails at Enchanted Rock. Several miles of trails weave around the majestic peaks of Enchanted Rock, Little Dome, Turkey Peak, Buzzard’s Roost and others, offering stunning scenery. You don’t have to look far to spot a white-tailed deer, lizard or vulture. 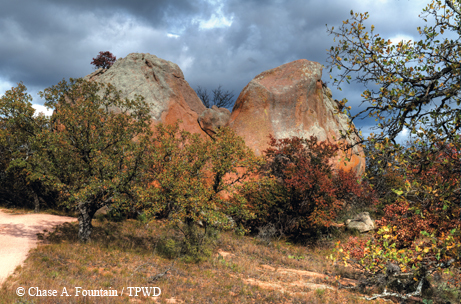 The diversity of plant life at Enchanted Rock is truly special because of the drier environment. Look for ferns, grasses, cacti, yuccas, shrubs and other plants that spring from cracks in the granite. For another unique experience, wait until dark and look up. Removed from urban sprawl, you can easily see the stars, planets and constellations, even the Milky Way. To recognize the park’s spectacular night skies, the International Dark Sky Association recently certified Enchanted Rock as an International Dark Sky Park. It is currently one of only two Texas state parks (Copper Breaks State Park being the other) with this designation. 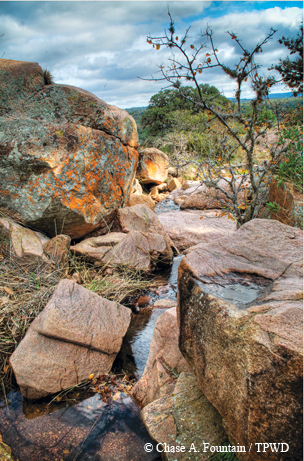 Enchanted Rock also offers ranger programs, camping, picnicking, rock climbing, geocaching and more. Your visit will be better if you’re prepared. Wear good footwear, bring lots of water and don’t forget that dogs need care, too. Park closures are possible on busy weekends and holidays for safety and resource protection; consider visiting on weekdays to avoid the crowds. The park is 18 miles north of Fredericksburg on Ranch Road 965, or from Llano, take Texas Highway 16 for 14 miles south and then go west on Ranch Road 965. For more information, call (830) 685-3636 or go to www.tpwd.texas.gov/enchantedrock.